Zipcar has made it to San Rafael, and that is absolutely wonderful news. It will make car-free living easier and opens up opportunities for the City of San Rafael to save money on its municipal fleet. It’s only three cars so far, but for downtown residents that may be all they need. Zipcar works on a subscription model. Light users pay an annual membership fee as well as rental cost per hour or per day, which are different depending on which car the user rents. Heavier users pay a monthly fee, no annual fee, and have lower hourly fees. Organizations, including universities, can also sign up, which is especially useful for businesses whose employees tend to travel a lot during a workday, though with only three cars available it wouldn’t be the most reliable service just yet. For this, Zipcar subscribers don’t just get access to a car. It covers the cost of gas, insurance, maintenance, replacement, and the home parking space. So while the up-front costs seem steep at first, the end result is that users often end up paying less than they would by relying on their own car. Yet despite that, these up-front costs do change the behavior of members (PDF). 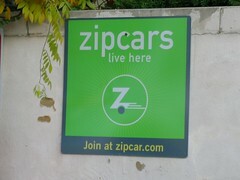 Zipcar subscribers have a barrier, albeit a short one, to using a car. Rather than simply hopping in the family sedan to drive to get a haircut, Zipcar members need to reserve their car for a selected amount of time, and they immediately see how much that trip will cost them. Maybe the trip would be worth it by car, but it turns driving into a conscious choice rather than a default alternative. As a result, use of modes other than driving increases among members. For planners and developers, this means drivers don’t need as much car space. Not only will they not be on the road as much, but they also won’t need to park in as many places and they won’t need their own personal parking spot. Zipcar’s spot, shared with others, will be enough. So a new housing development with a lot of Zipcar members won’t need as much parking, and a city with a lot of members won’t need its roads to be quite as wide. This behavioral shift isn’t unique to Zipcar, of course. Car-sharing services from Avis and Budget, as well as standalone services like Car2Go, are just as likely to change how people drive. If San Rafael wants Zipcar to expand, the city should allow developers to cut parking requirements from their projects if they host car-sharing cars or subsidize membership for their residents. This would build a client base for Zipcar or its competitors while also reducing the number of cars in our parking lots and on our roads. In short, Zipcar’s entrance into the San Rafael market is a Very Good Thing. Here’s hoping they’re here to stay.